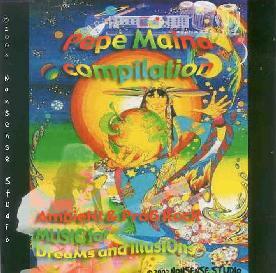 Pepe Maina - "Compilation: Ambient & Prog Rock Music for Dreams and Illusions"
It was tempting at first to slot multi-instrumentalist Pepe Maina's music into the "new age" category. With its mellow sounds and titles like Clouds and Whale Song it seemed to be the perfect soundtrack for the new age life. But on subsequent listenings, I hear a depth to Maina's music that I just don't hear in your average, run of the mill new age stuff. Maina's music is far more than noodling around while pleasing sound effects drift in and out of the mix. It shifts and changes within pieces, always keeping your interest, not quite wanting to settle into the background. Maina explores the outer edges of new age music, and doesn't feel the need to constrain himself at all to the rules of that particular genre. Sometimes, it reminded me very much of Ozric Tentacles in their mellower moments, like Phalarn Dawn or Become the Other, and at other times, it reminded me of some of the instrumental work of Anthony Phillips, but with a decidedly more worldly orientation than Phillips' studied Englishness. Maina uses his keyboards to create layers of ambient textures upon which he adds intriguing percussion tracks and subtle guitar work. While he doesn't quite rock out, Maina is not afraid to cut lose on his electric guitar on occasion. Waves, in particular, features some fine David Gilmouresque fretwork (reminding me a bit of Mudmen from Pink Floyd's Obscured by Clouds album). On other tracks, like the pleasing Autumn Dance, Maina gets into a cool European worldbeat vibe. My favourite track, and probably the most "progressive" is Shoro-iiat (an Ozric's sounding title in itself!) It begins with blissed out, trippy guitars and washes of electronics and flute, before kicking into something a little heavier, with groovy, primal, percussion and a groaning guitar solo. Ambient and Prog Rock Music for Dreams and Illusions covers Maina's work from 1978 to 2002, and makes for a nice overview of his music. For more information you can visit the Pepe Maina web site at: http://www.pepemaina.net. You can also email him at: pepemaina@pepemaina.net.